Indians Baseball Cards: Lofton heads for the hall (in Cleveland)! Solid Gold! 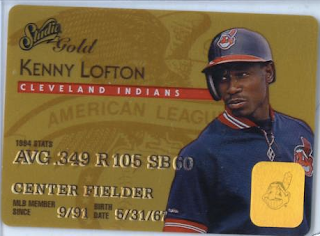 Well, at least Kenny Lofton is even if the card isn't really. Kenny Lofton was named to the 2010 Indians Hall of Fame. He will officially be inducted in August, 2010. Lofton is by far and away one of my all-time favorite Cleveland Indians players. In a weird way, when I watch "Major League," Willie Mays Hayes reminds me of Lofton. Face it, Lofton has skills so off the charts, the man was still stealing bases in 2007, setting a new post-season record. I don't know that I ever heard he 'officially' retired, though. But, as long as he is, he can count down the years until he heads to the National Hall of Fame, where I have little doubt of his election. I am also excited to see Lofton join Sandy Alomar from the 1990's teams in the team Hall of Fame and yes, one day he will be in the Hall at Cooperstown. The Hall of Fame induction is one game that my boys and I always try to go to.